The first time I tried a Vegan Baja Fish Taco was at a restaurant in LA. It was disappointing to say the least. The mock fish filet did taste like realistic, but not in an appetizing way. Being that Baja fish tacos used to be one of my favorite foods prior to becoming a vegan, I knew I could do better. Since I’m currently obsessed with portobello mushrooms (seriously, they are so meaty and delicious!) I wanted to try making Vegan Baja Fish Tacos using battered portobello mushrooms in place of processed mock fish. Chickpea flour (also called garbanzo bean flour) can be found in any health market. Aquafaba is the liquid from canned chickpeas. It makes an excellent vegan egg substitute. You can even whip it into meringue like we did in our Pink Lemon Meringue Pie! 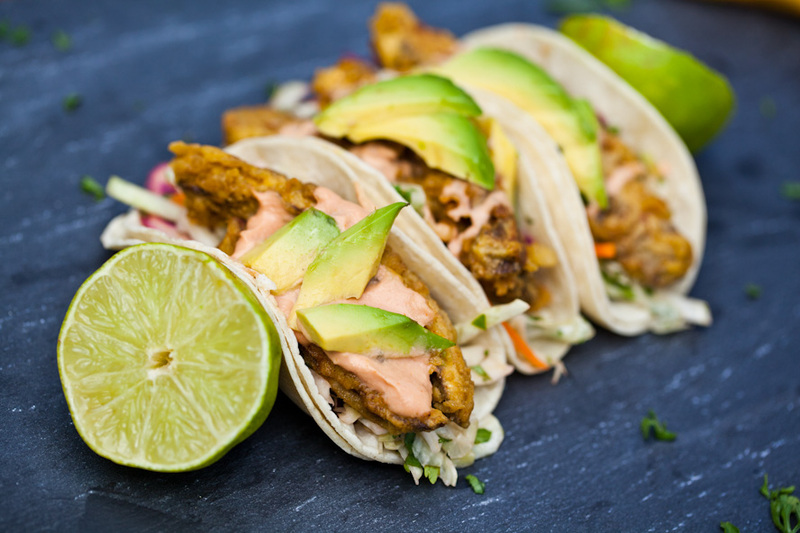 Chickpea battered portobello cutlets stand in for the fish in these street style Baja tacos. They're vegan, gluten-free, and taste great either baked or fried. Soak the cashews for 2 hours or overnight. If you are short on time, you can boil the cashews for ten minutes to soften. Combine the soaked and drained cashews in a high powered blender or food processor with the salsa and 1/2 teaspoon of sea salt. Blend Chipotle Cream for 2 minutes until smooth. The Chipotle Cream will keep in an airtight container in the fridge for up to 5 days. Prepare the Cilantro Lime Slaw. Trim the spores from the mushroom caps and slice them into cutlets. In a large shallow bowl, mix together the chickpea flour, kelp powder, garlic powder, smoked paprika, and 1 1/2 teaspoons of sea salt. This will be your batter. Pour the aquafaba into a second shallow bowl. Keep two forks on hand to batter the portobellos. To Batter- Dip the portobello cutlets into the aquafaba. Let the excess aquafaba drip off then coat it in the chickpea batter. Dip the battered portobello into the aquafaba again. Let the excess drip off and coat it once more in the chickpea batter. I recommend using one hand and one fork to batter the cutlets and the other hand and fork to dip them into the aquafaba. Wipe your hands frequently to avoid a buildup of batter on your fingers, which will make it more difficult to get an even coat of batter on your portobello cutlets. To Fry- In a small pan on medium to medium high heat, pour enough grapeseed oil to cover the pan to at least 1 inch in depth. When the oil is hot, drop the portobello cutlets into the oil and fry until golden brown, roughly 1-2 minutes on each side. Repeat until all portobello cutlets are fried, adding more oil as needed. To Bake- Preheat the oven to 375. Batter the portobello cutlets according to Step 4 and place them on a baking sheet coated with cooking oil spray. Bake the portobello cutlets for 15 minutes. Flip the cutlets over, spray them with cooking oil, then bake for another five minutes. If you prefer, you may skip the oil and cover the baking sheet in parchment paper. If using purple cabbage leaves, carefully peel the leaves apart. Be sure they are fully dry after washing them. If using corn tortillas, warm them in a skillet on medium low heat for about 15-20 seconds on each side. For traditional street style Vegan Baja Fish Tacos, assemble the taco using two corn tortillas. Spread a generous spoonful of Chipotle Cream on the tortillas, then place 1-2 portobello cutlets on top. Finish with Cilantro Lime Slaw. Makes 8 tacos. In a medium bowl, whisk together the lime juice, agave nectar, and olive oil. Stir in the cabbage, green onion, and cilantro. Mix well with your hands to combine. The Cilantro Lime Slaw will keep in a covered container in the fridge for up to 5 days. In a medium bowl, whisk together the lime juice, agave nectar, and olive oil. Stir in the cabbage, green onion, and cilantro. Mix well with your hands to combine. The Cilantro Lime Slaw will keep in a covered container in the fridge for up to 5 days. These Vegan Baja Fish Tacos taste amazing baked and fried. The fried tacos definitely taste more like the real thing while the baked version keeps better in the fridge. Try them both ways! For recipes similar to these Vegan Baja Fish Tacos, check out our Raw Vegan Tacos or our Portobello Gyros! If you love Vegan Baja Fish Tacos and want to save the recipe for later, pin the photo below! Looks great. Any way to make this taste right without oil? What can I use instead of cashews? Sunflower seeds? I made these for a dinner/movie date night thing at my place with another couple. My husband is a huge carnivore and I’m vegan, so sometimes dinner can be tricky. We were so thrilled how they came out– we fried them, although I want to also try baked– and everyone, I repeat everyone, loved them. I used Trader Joe’s seaweed flake snacks instead of nori powder, which worked beautifully. These are absolutely the best version of fish tacos I’ve had since I went veg. The slaw and sauce were both huge hits as well. Thank you, thank you, thank you! What a great idea to use the seaweed snacks! I’m so happy you like the recipe!! Hi this looks great. I can’t find Kelp Powder outside of a prefilled bag at Whole Foods. I honestly don’t want that much. Can I substitute an egg white protein powder I use for it? I would suggest using another type of seaweed to replace the kelp, it’s what provides the umami seafood flavor (in a totally delicious way, I promise!! One reader above used a seaweed from a Trader Joe’s snack pack. Hope this helps! I actually found some packaged dried kelp and put it in The blender. It worked great. I made these for a dinner party at my place that included three carnivores— people were lining up as they came out of the fry oil to get seconds and thirds! Thanks so much for coming up with this recipe, I’ve since shared it and made it a few more times.